Designed as the perfect pair, this enchanting bridal set is the ideal symbol of your love and devotion. Crafted in 18ct white gold and features an engagement ring set with a 40pt baguette cut diamond in a cluster setting with diamond encrusted shoulders, and a half eternity style diamond wedding band. 18ct white gold 40pt baguette cut diamond cluster bridal set is rated 4.0 out of 5 by 1. Rated 4 out of 5 by Anonymous from Beautiful set with plenty of sparkle My husband bought me this set to replace my original engagement ring that sadly got damaged. For me the engagement ring is a real show stopper, the baguette diamonds are a little different and although they shine rather than sparkle, the halo style and decorated shoulders certainly catch the light! 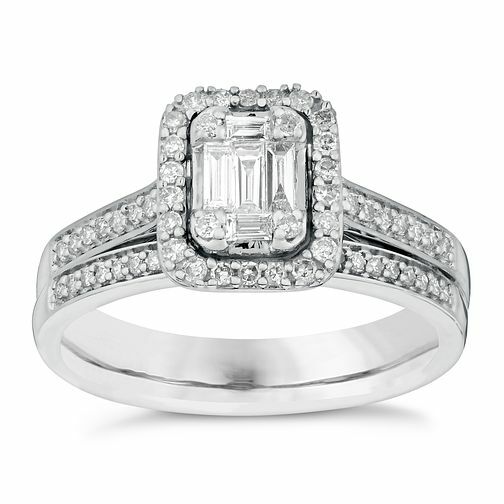 The Art Deco style is a favourite of mine and having the bonus 'wedding' band too was great for the price, not that I needed it as we're already married, but a girl can never have too many diamonds. I've scored it as 4 out of 5 as personally if I had needed the wedding band I would have been a little disappointed with it as it's very very dainty and almost gets lost against the engagement ring. But that's just my opinion and I'm thrilled to own such a beautiful set, I'm only sad I won't get to flash it around as you do when newly engaged!